Need a professionally designed art portfolio website? We Can Help! Get Started Today! our websites for artists are professional, affordable, easy to setup, and easy to update – and our great personal customer service is second to none. Show your art in the best light possible – get a professional online artist portfolio website from NM Artists today! 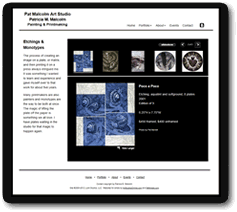 Try it now and see just how easy it is to create your new art portfolio website. Designed by Artists for Artists. We know the business of art. Update your website anytime using our easy online tools. Add, edit, delete images and text and even change website designs online 24/7 – and at no extra charge. Our websites for artists are easy to setup and easy to update so you can spend less time at the computer and more time in your studio. Ready to get your art online? We have artist website plans to fit any budget. 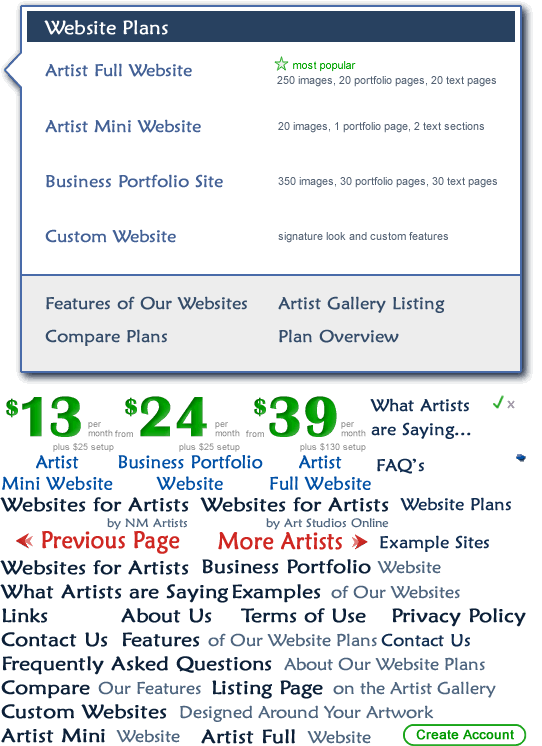 The Artist Full Website is our most popular plan. Get a full featured artist website for just $24/month. For those artists who only need a simple solution or those who are just starting out in their art career, the Artist Mini Website is a great affordable option at only $13/month. With flexible plans and payment options, we make it easy and affordable to get your own artist portfolio website today. And, if you pay annually you will receive a discount. Our websites for artists include a domain name, hosting and email. We understand that it is important for you to be able to update your art portfolio website quickly and easily – and at no extra charge. Login anytime and add, edit, or delete both text and images. Want a different look? Go ahead and change template designs and colors. It's easy. Our simple online editing system makes it easy to make changes to your website whenever you need to 24/7. Ready to get started? Create an account and try it today! Your artist portfolio website should be easy for both people and search engines to read. Our artist websites are written in search engine friendly HTML – not Flash. In addition, we test our sites to make sure they work in all the major internet browsers as well as the iPad and iPhone. We are well versed in search engine optimization (SEO) techniques and best practices. We automatically setup up image alt tags and page metatags for you to provide the search engines with as much information as possible regarding your website. In order for a website to rank well with the search engines, it has to contain great written content. We can help you with this too. Check out our Blog and our Facebook Page for tips on how search engines like Google work and how you can optimize your website content for better rankings. We are artist owned so we understand the challenges you face when marketing your artwork. If you've got a marketing question, just let us know. And check out our Blog and our Facebook Page for tips and resources regarding art marketing, photographing artwork, basic business info, best practices, as well as tips to help you make the most out of your artist website. NM Artists Websites for Artists are the result of the partnership between a professional working artist and an experienced website programmer. See how easy it is to get YOUR artist website! At NM Artists, YOU are our number one priority. This means if you have questions you can contact us and we'll be happy to help. Want to see what YOUR work could look like on one of our artist portfolio website templates? We're so confident you'll love our websites for artists, we're offering a free trial. See for yourself how easy our system is and how great your artwork can look on one of our professionally designed artist portfolio websites. We'll build you a sample artist website free for 15 days. At NM Artists, we believe that the best websites for New Mexico artists are professional looking and simple to use, easy to setup, easy to update, flexible,local and affordable. We have created our artist website templates with these qualities in mind. 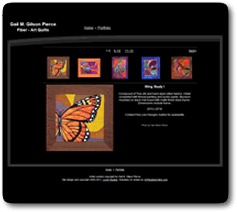 Our simple online system makes it easy to create and to update your art website online 24/7. We offer a variety of artist website plan options to meet every need and budget. 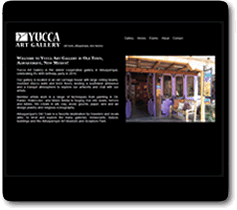 And, because we are New Mexico artist owned, we understand the art world and our personal customer service is unmatched. Are you an artist, but not from New Mexico? Art Studios Online is our sister website representing artists from around the world.